The cookery book will be given out free to new students joining the university this year as a part of their welcome packs. It is hoped the books will help students to eat healthily whilst living away from home, in some cases for the first time. 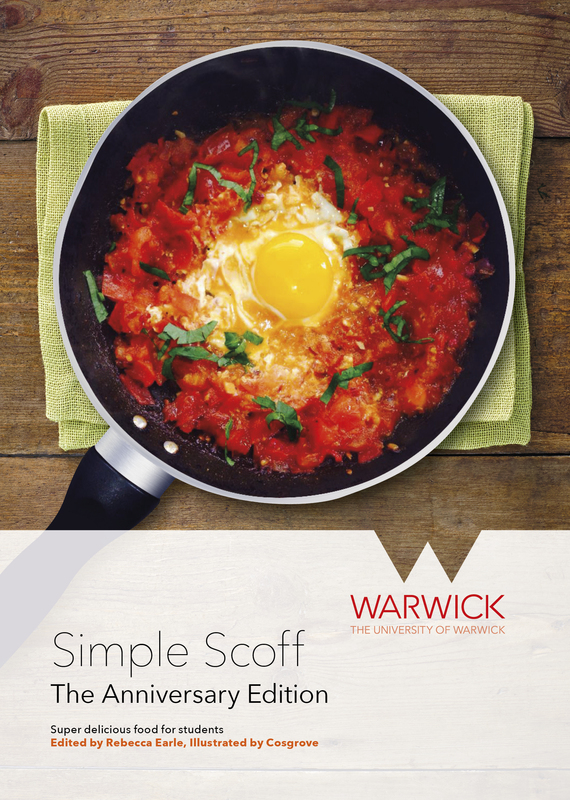 The book, put together by Rebecca Earle of the University’s History department, updates Simple Scoff, an innovative cookbook first published in 1972 by the University of Warwick Student Union and Lady Doris Butterworth, the wife of the University’s first Vice-Chancellor. Simple Scoff consisted of recipes and cooking advice contributed by students and other members of the university community, aimed explicitly at students. Nearly 50 years after ‘Simple Scoff’ was published, culinary tastes have moved on. Garlic is no longer regarded with suspicion, and spices are easily accessible. The recipes in Simple Scoff: The Anniversary Edition showcase a range of ingredients virtually unimaginable on the 1972 Warwick campus: za’atar, crème fraîche, Korean rice cakes, chia seeds and fresh ginger. Garlic is deployed without trepidation. White sauce has more or less disappeared, replaced by dhals, spicy tomato-chilli blends and feta cheese. Changes in eating habits are further reflected with more than half of the recipes being vegetarian or vegan. The new Simple Scoff reflects both the transformation in eating habits in the half-century since the founding of the University of Warwick, and also the commitment to the life-affirming qualities of honest, tasty food that underpinned the original Simple Scoff. To launch the book, a live cooking demonstration of the recipes will take place at the ‘Festival of Imagination’ on 17 October 2015 at 18:45 in the Studio of Warwick Arts Centre. Copies will be on sale in the University bookshop too, with profits going towards the Warwick in Africa / Warwick in India projects. To order a copy of Simple Scoff: The Anniversary Edition please visit: our bookshop online. To experience live cookery demonstrations of the recipes please visit: The Festival of Imagination.